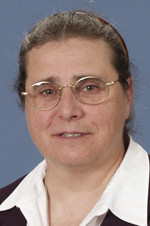 Sister Rose Marie Eichner, O.S.F. Sister Rose Marie Eichner, O.S.F., (formerly Sister Miriam Eugene), died Nov. 6 in Assisi House, Aston, at age 75. She had been a professed member of the Sisters of St. Francis of Philadelphia for 54 years. Sister Rose Marie was born in Allentown, Pa., where she was a member of Sacred Heart Parish. Prior to her entrance into the congregation in 1960, she attended Central Catholic High School. She professed her first vows in 1963. Sister Rose Marie earned a Bachelor of Arts in social science from Neumann University in 1975 and ministered primarily in education, health care and pastoral care. She ministered for 35 years in the Archdiocese of Philadelphia, teaching at St. Stanislaus School in Lansdale and working for many years in health care at St. Mary Hospital, St. Agnes Hospital and St. Mary Medical Center in Langhorne. She also served in the Allentown Diocese as well as in Massachusetts and Wilmington, Del. Sister Rose Marie volunteered for many years at Our Lady of Angels Convent and at Assisi House in Aston. In 2011 she moved to Assisi House where she served in prayer ministry until her death. The funeral Mass was celebrated Nov. 8 at Assisi House. Burial followed in Our Lady of Angels Cemetery in Aston. Sister Rose Marie is survived by her sisters, Susan Eichner and Marianne Roth; nieces, nephews, great-nieces, great-nephews and by her Franciscan family. Donations in her name can be made to Franciscan Ministries Foundation, 609 S. Convent Road, Aston, PA 19014.